Two photos on cardboard backing, each measuring 5 x 7.25 inches. Both are from a photographer in Shell, Wyoming. The photographer’s name is handwritten, and I’m not certain I am reading it correctly. It appears to be A. F. Trow, but you can view the handwriting here to judge for yourself. 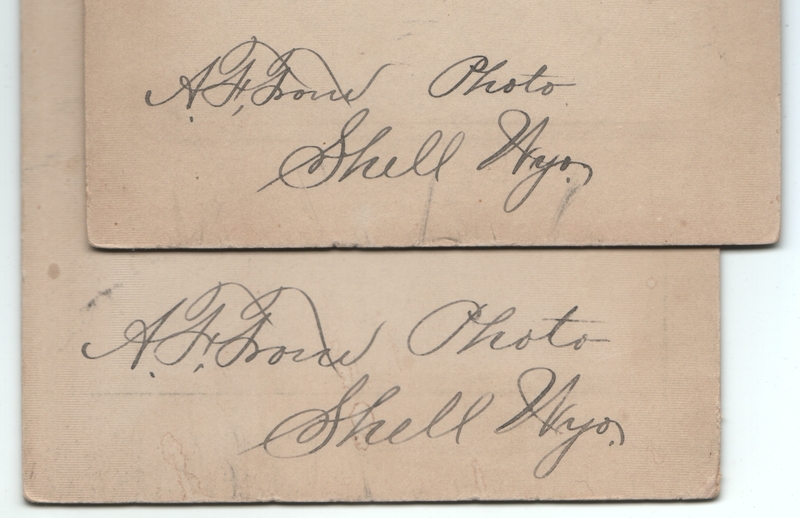 Also written on the back of the right-hand photo in a different hand is For Robert. I decided to post these photos together because they are interesting to compare and contrast. The men’s faces and the women’s dresses are similar enough at first glance that I had to look more closely to make sure they weren’t photos of the same people. Shell, Wyoming, named after nearby fossil beds, had a population of only 83 in the 2010 census, and I didn’t find any indication it was any more booming back when these photos were taken. That doesn’t mean life wasn’t good for these folks. 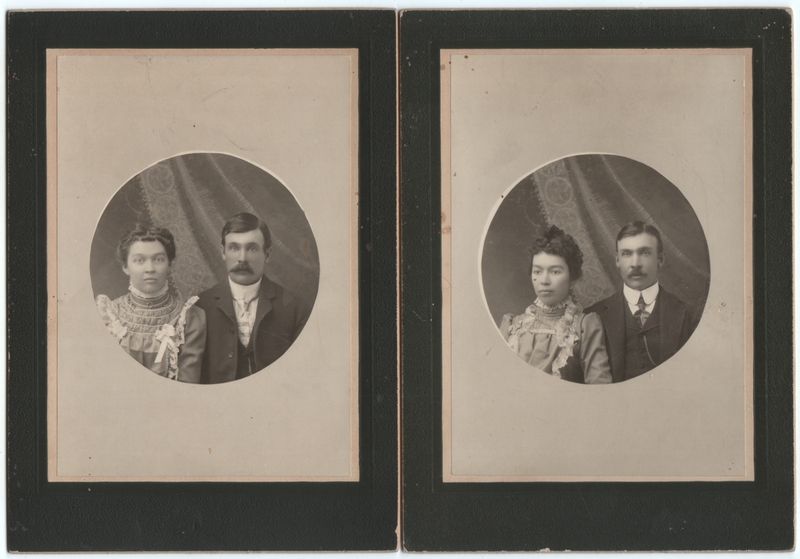 It just suggests that getting these photos taken was probably something special. The men looked so much alike, at first glance I thought it was the same couple…until I read your explanation. I wonder if they were related. I wondered the same thing. Maybe they are brothers? Thanks, Jenna, I’m glad you like them. Yes, I also had to make sure it wasn’t the same guy getting a photo taken with his wife and another with his mistress. LOL I suppose a little photography studio that couldn’t even afford to get its name printed on its cards (or was perhaps too new) wouldn’t have a huge assortment of backdrops. That’s my guess, anyway. Such an uncanny resemblance. It could be twins who dated or married sisters. It happens! Yes, indeed. In a tiny town in frontier Wyoming, I imagine choices were limited.